By Andrew Phelps June 28, 2011, 5 p.m.
Chesapeake Energy was not pleased, to put it politely, with Sunday’s New York Times story about the natural gas industry. The piece quotes from company emails to suggest Chesapeake executives are overstating productivity and profitability. Back in the day, a corporation stung by a newspaper story might try to buy a full-page ad in the paper. But that route was controlled by the very organization they were battling. Targeting PR ad dollars toward social media is another sign it isn’t just stories that can spread virally — it’s also the conversations around those stories, pro or con. I’m trying to get in touch with Chesapeake for an interview, but until then I’ll note that their move seems to be an evolution of one we reported on in late 2009. Back then it was the New Zealand fishing lobby that was mad at The New York Times, about a story alleging overfishing. The New Zealand Seafood Industry Council bought Google text ads in response to a the story. The ads (“NYT Apologizes for Story”) targeted users discussing the Times article in their Gmail accounts or searching for more information about the bug-eyed hoki fish, linking users to a critique of the article. Of course, an ad impression only goes so far: Chesapeake’s spin is shareable, commentable, and retweetable. POSTED June 28, 2011, 5 p.m.
Phelps, Andrew. "Chesapeake Energy fights bad PR by buying Promoted Tweets on Twitter." Nieman Journalism Lab. Nieman Foundation for Journalism at Harvard, 28 Jun. 2011. Web. 19 Apr. 2019. Phelps, Andrew. "Chesapeake Energy fights bad PR by buying Promoted Tweets on Twitter." Nieman Journalism Lab. Last modified June 28, 2011. 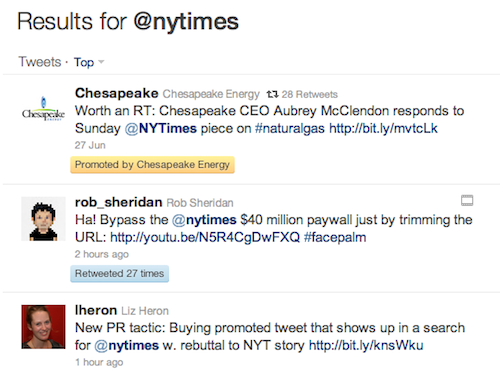 Accessed April 19, 2019. https://www.niemanlab.org/2011/06/chesapeake-energy-fights-bad-pr-by-buying-promoted-tweets-on-twitter/.